Kinetech Arts Featured Artist Presentations, which occur on the last Wednesday of each month, are a showcase for creators, artists, scientists, makers and thinkers to discuss their work and life. There is a $5 suggested donation. 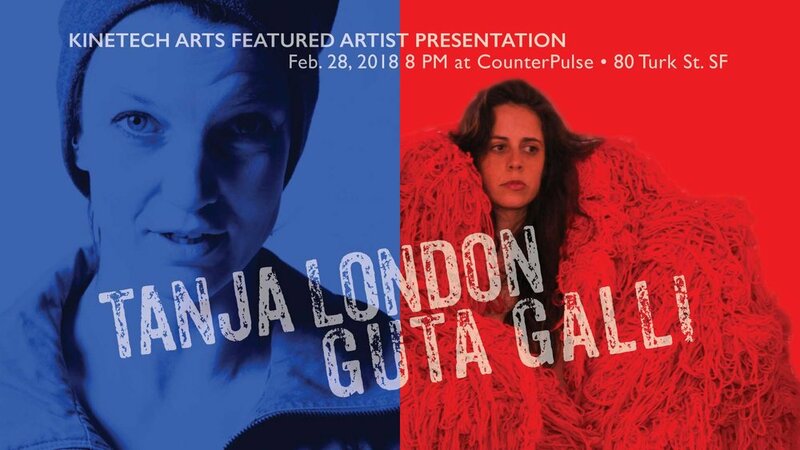 This month Kinetech Arts is proud to present Tanja London and Guta Galli. Tanja London is a visual, haptic and kinesthetic artist based in East Oakland. She grew up in Germany rummaging around in the beautiful wide spread forests of the South and in the WWll family history. Querying social and hierarchical constructs is an integral part of who she is. Her work has a feminist viewpoint and explores sociopolitical and ecological discourses such as inherited stress and trauma, the cultural impact of military technology, and the erosion of democracy. Besides a BA in Social Pedagogy and Contemporary Dance she holds a MFA in Modern Dance including a Screendance Certificate. Guta Galli is a Brazilian interdisciplinary artist working withphotography, video, installation, performance art and social practices. Her current researches study the intersections between womanhood, power, race, sexuality and violence.She has received her MFA from the San Francisco Art Institute in 2017 and has exhibited individually in Rotterdam (Brazil Rotterdam Festival / Netherlands) and São Paulo (Matilha Cultural and Legislative Assembly of São Paulo), and has also participated in several art fairs and group exhibitions in São Paulo (SP-ARTE), Rio de Janeiro (RIO-ARTE), Santiago (Chile), Brasília, Santiago, Rome (Biennale / Italy) and in the US, where she performed individually and/or participated in group shows at the San Francisco Art Institute, SOMArts, Berkeley Art Museum, Root Division (SF), Walter Maciel Gallery (LA), Start Up Art Fair (SF and LA).